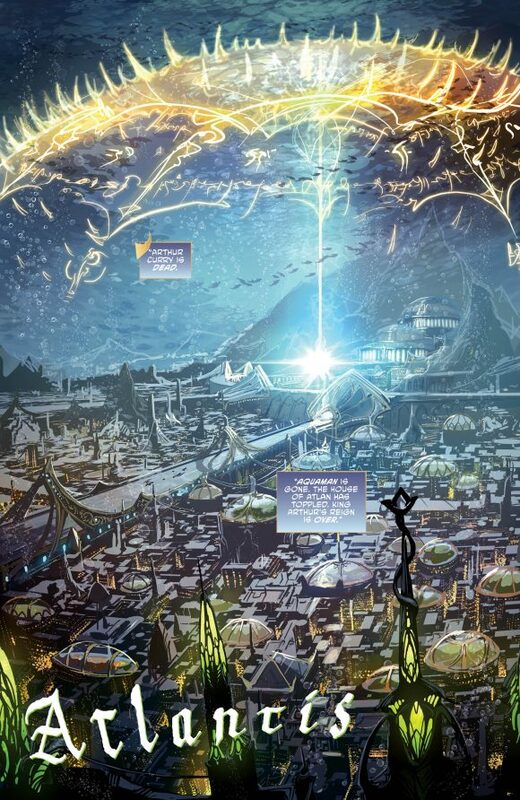 Writer Dan Abnett has been doing a bang-up on the Rebirth iteration of Aquaman, working with a rotating cast of artists who have been bringing his stories of the Aquatic Avenger to life. 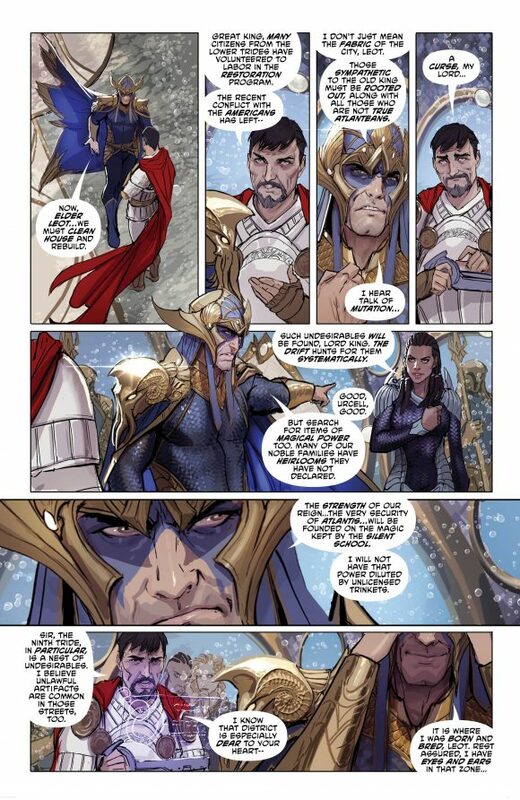 Now DC has decided to downshift the book from its twice-a-month publishing schedule and hand the art chores over to a single illustrator, in this case Stjepan Sejic. 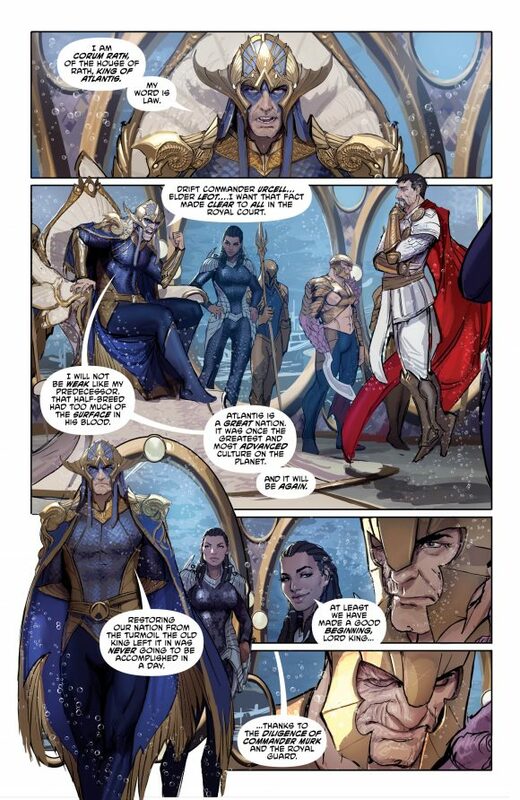 Sejic makes his debut on the title with this week’s #25, a double-sized issue that introduces us to an Aquaman that looks a little different… and familiar. 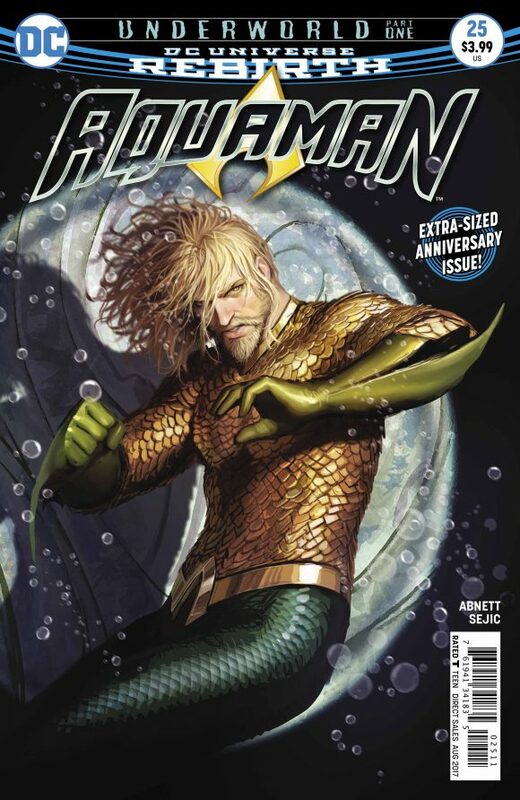 When #25 begins, it seems Aquaman has been “killed” by Corum Rath, who has subsequently assumed the throne of Atlantis. 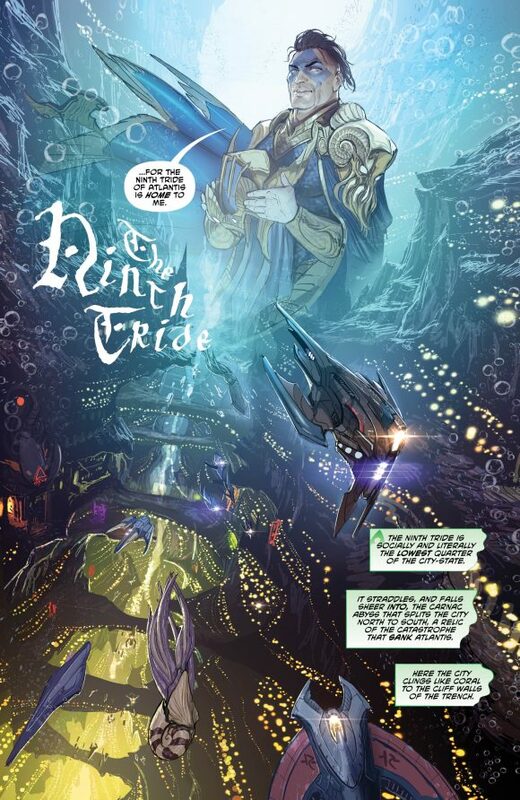 Rath had been the leader of an Atlantean splinter group known as the Deluge, who used terroristic tactics to force a war with the surface world, something Aquaman was keen to avoid. Rath believes Atlantis has suffered under Aquaman’s weak hand and is convinced they can go it alone. Basically, he wants to Make Atlantis Great Again, and he has a squad of apparatchiks who will help him do it. If that means rounding up “undesirables,” so be it. Of course, our hero isn’t dead, he’s simply lying low for now. Sporting long hair and a beard, he doesn’t attract any attention amid the rabble. Why would he? He’s been dead for weeks! Arthur has a close encounter at one point, but his low-key demeanor convinces his would-be attacker that this schlemiel is no one to worry about. Meanwhile, in Amnesty Bay, Maine, Mera and Tula are dealing with the aftermath of what they believe is Arthur’s death. Mera makes like Bella Swan, sitting and staring out the window, saying nothing, refusing even to eat. Unbeknownst to her, however, there’s a glimmer of hope on the horizon. So as not to spoil the book (out now), we’ll stop here. No points for guessing that Aquaman makes a big comeback, but there are some other genuine surprises in store, including the return of a former member of what is loosely thought of as the Aquaman Family. Stjepan Sejic’s work marks a major departure for the series’ visuals, at least in its Rebirth incarnation. Less directly comic book-y than the previous work by Brad Walker (which was excellent), Philipe Briones and Scot Eaton, Sejic bathes the characters in warm, painterly hues that are quite attractive to look at. Some of his action scenes are a little on the stiff side, but he more than makes up for it with distinctive character work and subtle body language. In particular, his visualization of the aforementioned returning member of the Aquaman Family is superb, giving the character a fresh look while retaining a lot of what made them so memorable in the first place. Overall I liked Aquaman #25 quite a bit. For a while now Dan Abnett has been using real-world events as fodder for his Aquaman stories (a violent, impulsive nationalist comes to power trashing his more cerebral, half-breed predecessor, accusing him of being a weak-kneed appeaser), but is also using thematic threads that have been part of the Sea King’s comic-book adventures for decades. 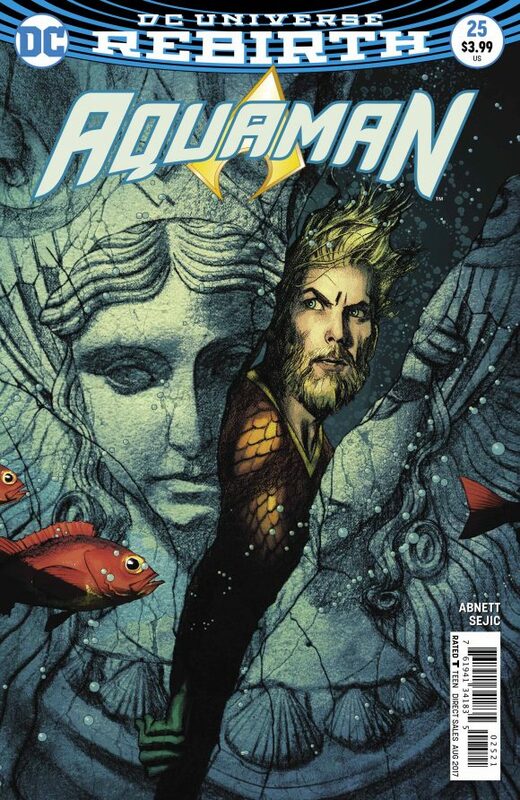 I have said numerous times, both on my Aquaman show The Fire and Water Podcast and my blog The Aquaman Shrine, that while I appreciated DC giving us twice as much Aquaman than normal, I was not a big fan of the rotating art teams. I thought it left the series feeling a little disjointed and was willing to see it go back to a monthly if that meant we could have a consistent creative team, issue to issue. It seems that, for the time being, DC is granting that wish. Abnett and his new partner Sejic are off to a great start, and that’s all this Aquaman fan can ask for. Rob Kelly is a writer/artist/comics and film historian. He is the co-host of Aquaman and Firestorm: The Fire and Water Podcast, the host of The Film and Water Podcast, and the host of TreasuryCast. He desperately wants an Aquaman title to reach more than 75 issues.